Citation Information: J Clin Invest. 2005;115(2):209-218. https://doi.org/10.1172/JCI24282. Liver fibrosis is the excessive accumulation of extracellular matrix proteins including collagen that occurs in most types of chronic liver diseases. Advanced liver fibrosis results in cirrhosis, liver failure, and portal hypertension and often requires liver transplantation. Our knowledge of the cellular and molecular mechanisms of liver fibrosis has greatly advanced. Activated hepatic stellate cells, portal fibroblasts, and myofibroblasts of bone marrow origin have been identified as major collagen-producing cells in the injured liver. These cells are activated by fibrogenic cytokines such as TGF-β1, angiotensin II, and leptin. Reversibility of advanced liver fibrosis in patients has been recently documented, which has stimulated researchers to develop antifibrotic drugs. Emerging antifibrotic therapies are aimed at inhibiting the accumulation of fibrogenic cells and/or preventing the deposition of extracellular matrix proteins. Although many therapeutic interventions are effective in experimental models of liver fibrosis, their efficacy and safety in humans is unknown. This review summarizes recent progress in the study of the pathogenesis and diagnosis of liver fibrosis and discusses current antifibrotic strategies. Changes in the hepatic architecture (A) associated with advanced hepatic fibrosis (B). Following chronic liver injury, inflammatory lymphocytes infiltrate the hepatic parenchyma. 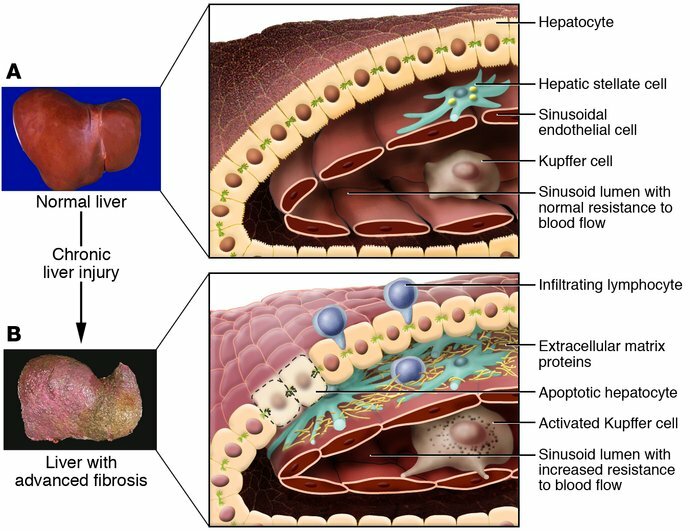 Some hepatocytes undergo apoptosis, and Kupffer cells activate, releasing fibrogenic mediators. HSCs proliferate and undergo a dramatic phenotypical activation, secreting large amounts of extracellular matrix proteins. Sinusoidal endothelial cells lose their fenestrations, and the tonic contraction of HSCs causes increased resistance to blood flow in the hepatic sinusoid. Figure modified with permission from Science & Medicine (S28).